With ongoing popularity of home decor shows, it’s very easy to get bit by the home renovation bug. One of the best places to start with a facelift is your laundry room. It’s generally small and often overlooked when it comes to redoing rooms in the house. 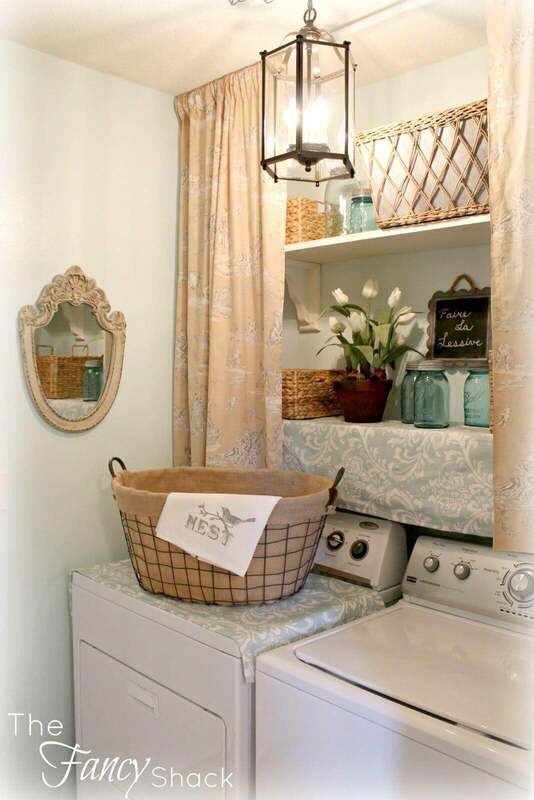 However, your laundry room is truly a good place to experiment with styles and can be done on any budget. 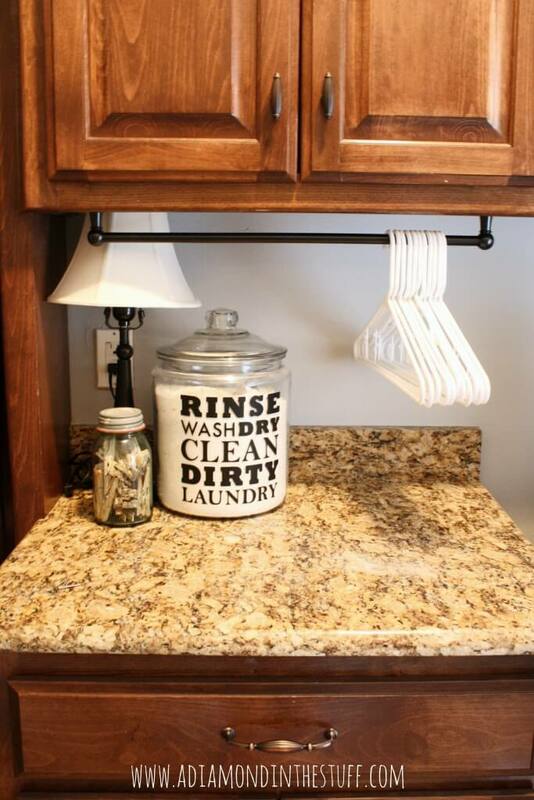 Laundry room organization ideas are not hard to find and they are easy to carry out. Don’t be surprised if you find yourself redoing the laundry room more than once a year once you see how easy and fun it is! Be creative and let your inner designer out to play. To help get you started, here are the top 20 laundry room organization ideas that are sure to appeal to any style (and budget) so pull out that hammer and don’t be afraid to take some risks! Do away with the catch-all laundry hamper and use laundry baskets to help organize your laundry before laundry day. Ideal for rooms with some extra space that is just begging to be repurposed. 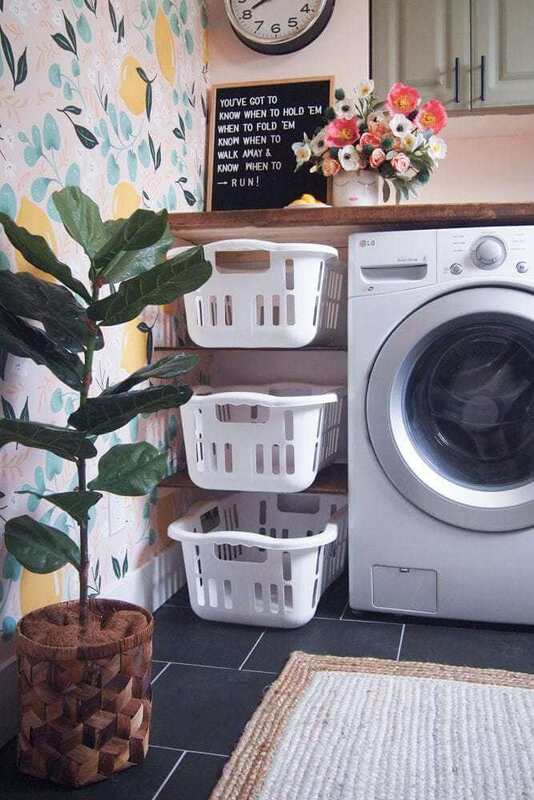 Stacked shelves hold laundry baskets that are easy to slide in and out. This keeps laundry off the floor and it can be sorted on the spot. If you’re not a fan of your cabinets, remove the doors and install a curtain rod instead. Your color and style options are endless and it adds a sophisticated level to your laundry room unlike anything else. Round out the look by draping complementing table runners over the top of your washer/dryer to enhance the chic look. No matter how hard you try, there always seems to be a stray sock (or three) that end up missing at the end of a laundry day. 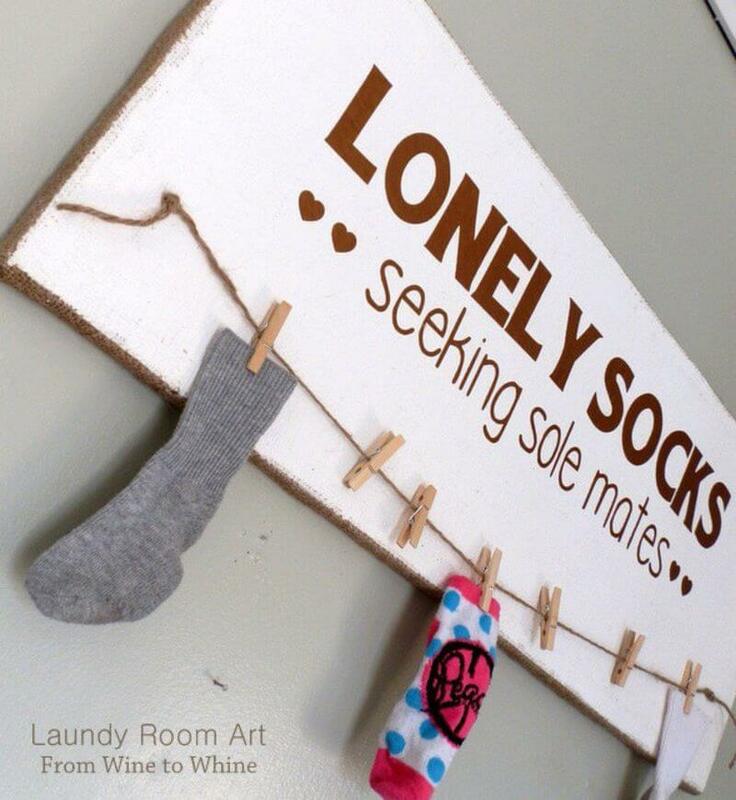 To ensure their partners are found, create (or purchase) a wall piece that allows you to hang up your socks. Singles are easy to spot and remove once paired properly. Give your laundry room a facelift by painting the room (and cabinets) a soft white; accent the area with a few rustic design elements to complete the makeover. It will be so enticing you will almost want to do laundry. This kind of project is ideal for anyone on a limited budget. It is also beneficial for those of us who don’t have the time, or resources, to redo cabinets. Lastly, it’s good for those of us who may be renting and cannot redo areas of the house. If you have a mudroom or hallway of sorts leading to the laundry room, maximize your space by removing potentially bulky furniture and replacing it with hooks. You’ll have access to a multitude of styles and colors that will match your taste. It keeps things off the floor and easily accessible for you and your family. It’s also a super-easy organizational step that can be accomplished in just a few short hours. If you have space between your washer and dryer that is too narrow for full-sized laundry baskets, consider installing a small, narrow shelving unit that can hold cloth baskets (or woven ones, depending on your preferred style). The addition of baskets on the shelves will keep things from being sloppily shoved into the nooks and crannies while maximizing space. Oh… but perhaps this isn’t so crazy after all. 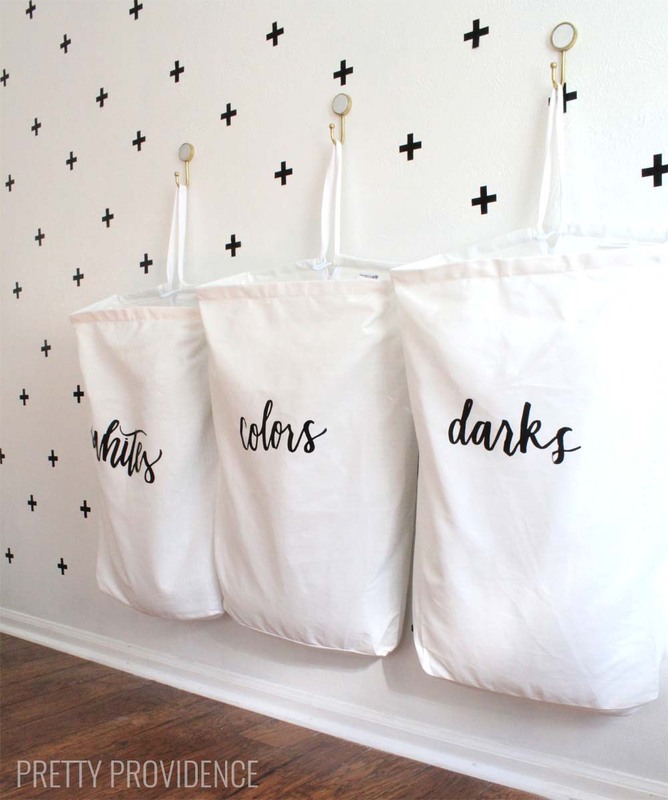 If your space lacks an area for drawers or shelves, repurpose one of the walls with hooks and canvas bags. Each bag serves a different laundry function (e.g. whites, darks, delicates, etc.) Bonus: They can be laundered too from time to time. This is a unique spin on an old, organizational classic and a space-saver as well! Ironing boards can sometimes be quite tricky to store because they are rather bulky. 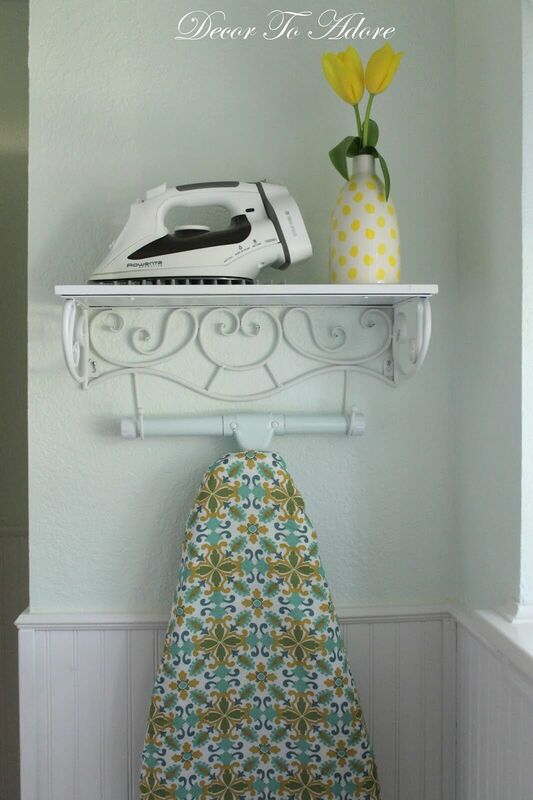 If you don’t have a door in your laundry room, or if your door isn’t used too much, repurpose a corner of the laundry room (or a closet if you have one) for a shelving unit that also doubles as an ironing board rack. These are easy to find and often have a top shelf of sorts that you can use to store your iron and other accessories. 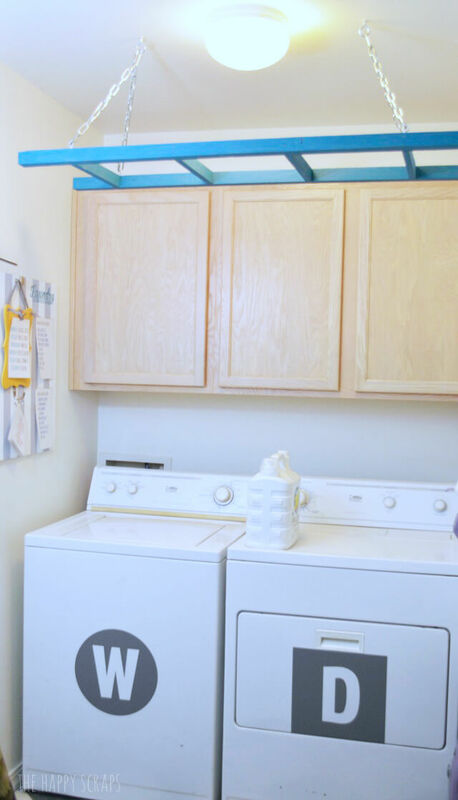 If you’re prone to keeping your wash-related items behind doors or in cabinets, you can still give your laundry room a makeover without introducing new ways to organize. Add a personal touch by installing shelves above your hampers (or baskets). 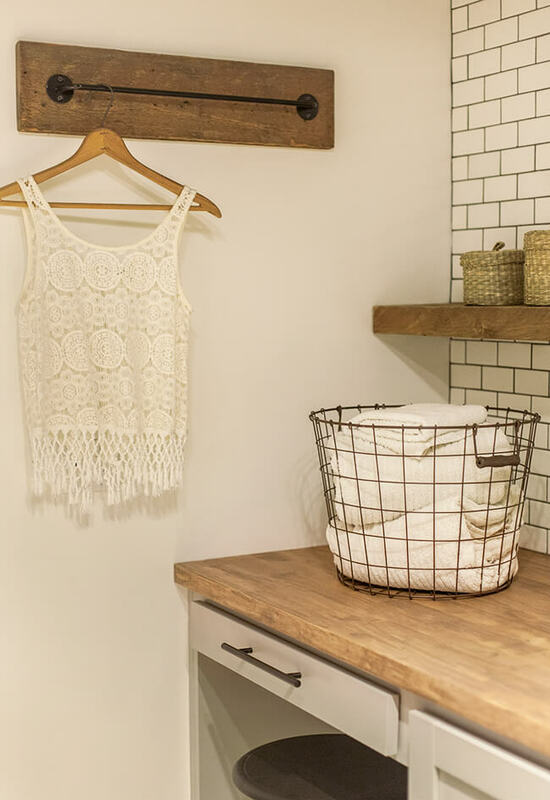 Instead of adding baskets for laundry items, use this space to personalize your laundry room. Add some vintage items or a flowers to bring a fresh perspective to the room. Cork boards are easy to find in craft stores and they are a cinch to install in your laundry room! For a simpler look, choose one to hang inside of your cabinet or on a visible wall. For an added fun touch, choose two or more patterned cork boards to complement each other. As a bonus, decorate them with contrasting fabric or scrapbook paper to keep a creative, bright touch in your laundry room. Go big or go home with some giant clothespin wall pieces. They add a unique element to any wall and they can hold a variety of objects from small bags to drying blankets. The traditional wood appeals to both traditional and modern designs and match well with laundry room organization ideas. 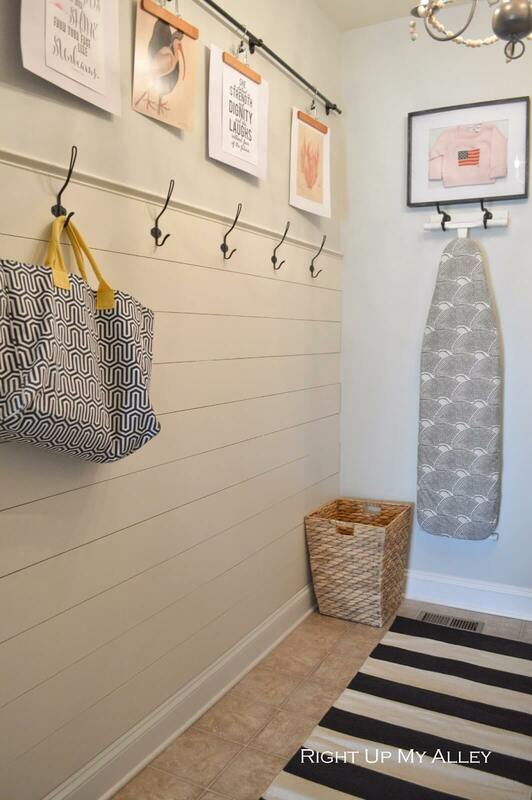 Many of us struggle with random, small gaps in our laundry room. Put that awkward space to good use! 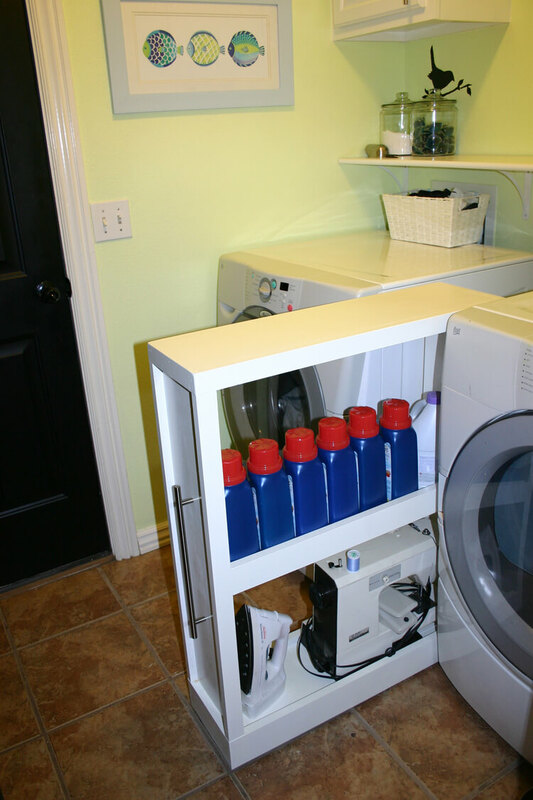 Install a small, vertical cabinet that stretches the height of your washer or dryer. Use this to store a variety of things – it’s even better if you can install small drawers inside (space permitting) and then you can use it for clothespins, detergent packets/pods, treasures found in pockets, and more. 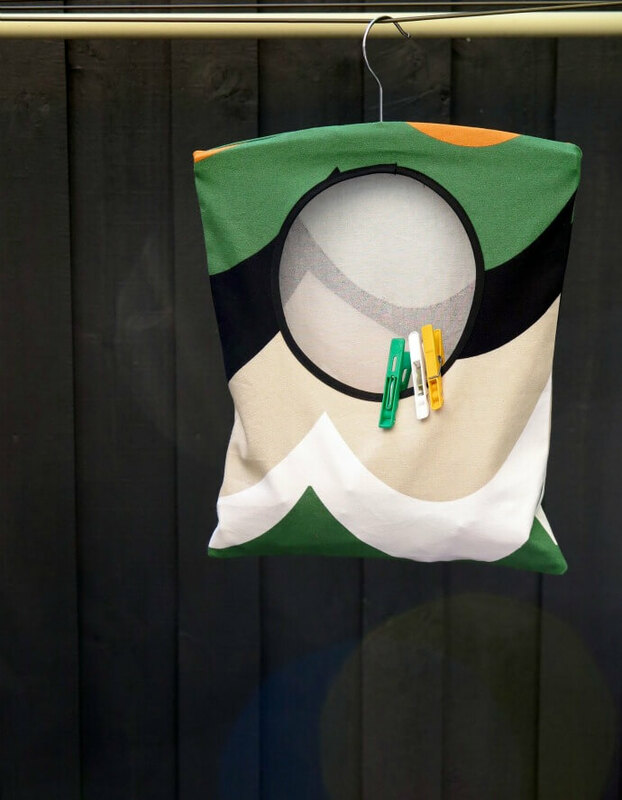 If you have a sewing machine, it’s a cinch to whip out a hanging clothespin bag. Otherwise, they are also available at most stores for purchase too. It is also fun to go along with the holidays too as you can swap out the bag designs based on the holiday. A simple, hanging bag to go in any closet. Gone are the days where you need to hang delicate, air dry only clothing across the back of a chair or outside on a line. 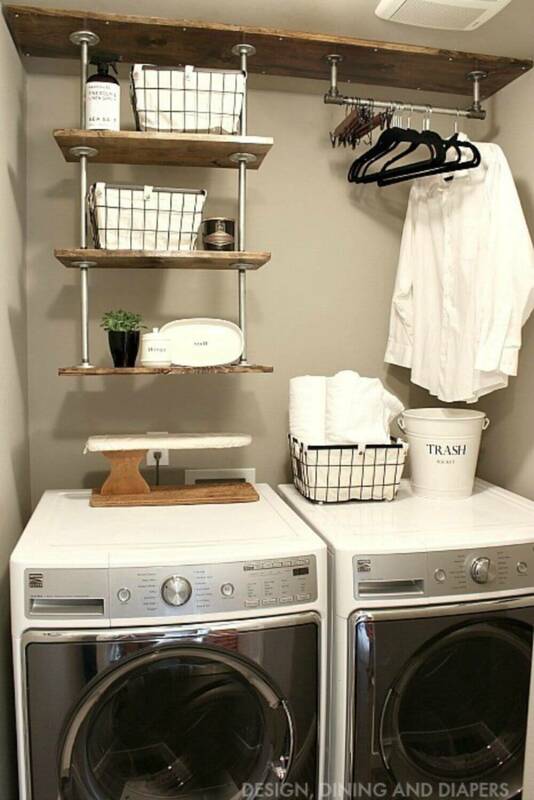 Install horizontal, drying racks in your laundry room that can easily handle your delicates. Top off these ‘shelves’ with nice, open-fronted boxes that will keep your detergents and other accessories organized and easy to access. 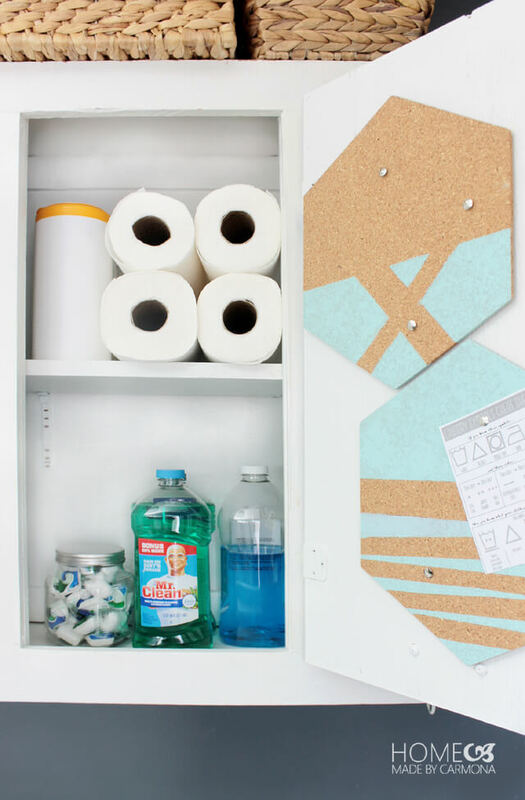 Spruce up your laundry room organization with this modern design. Install a finished piece of wood above your washer/dryer close to the ceiling. From this, hang some open shelving and a short rod to store your hangers. 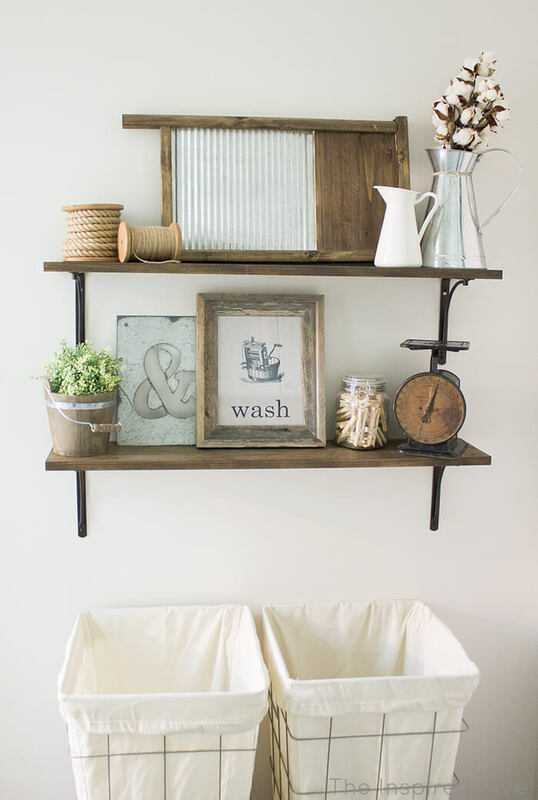 For a creative spin, mix up materials such as using metal poles and wooden shelves for contrast. If space allows, the small rod can also double as a drying space for extra-delicate clothes and it functions as a place to hang clothes post-iron. To break up some of the monotony of identical cabinets, remove a cabinet (or two) and repurpose the newly found space. 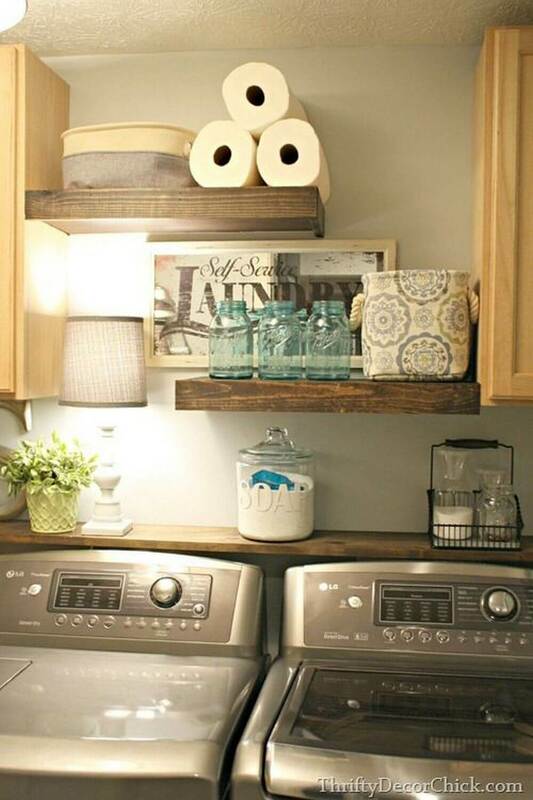 Install several floating shelves and use them to store your laundry accessories. 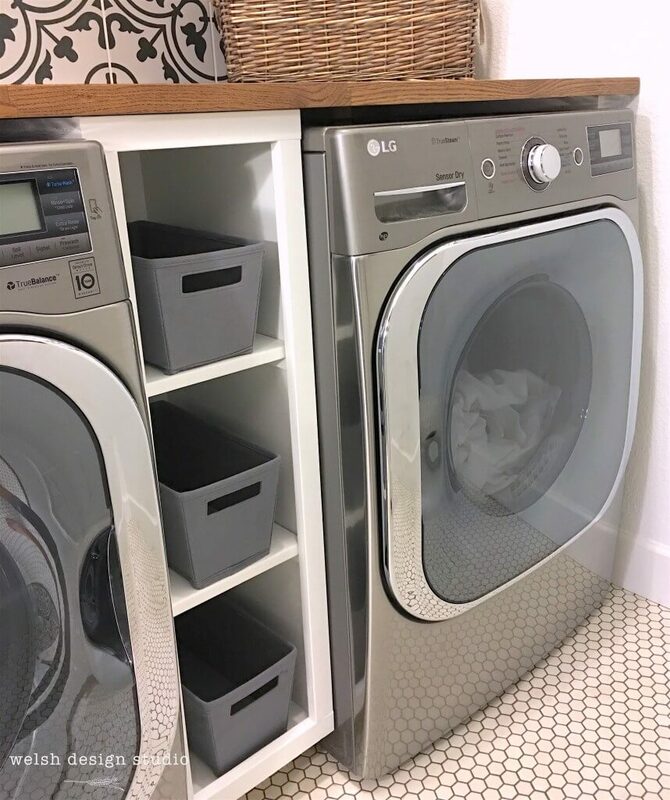 You can also continue the shelving theme by installing a thin, single shelf that runs the length of your washer/dryer and sits just above them. Not all laundry rooms are made to have a chic, modern, high-end design appeal. 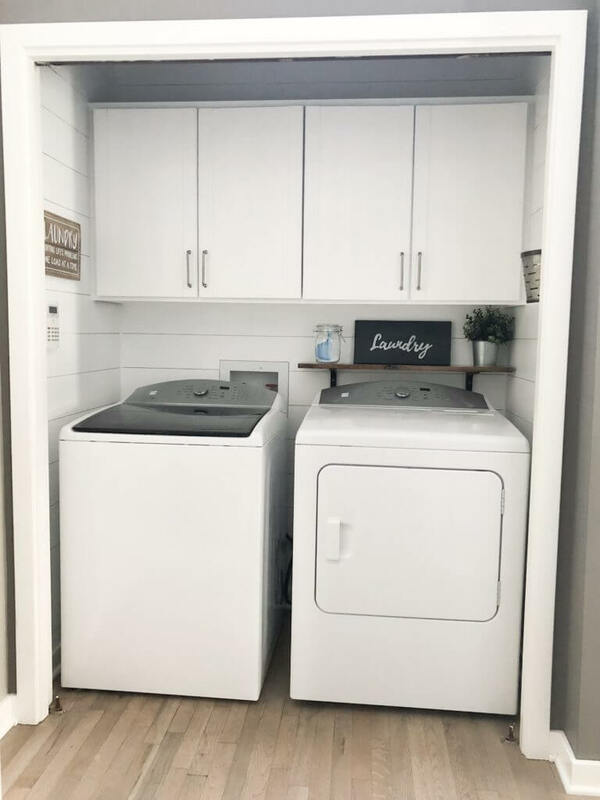 If you’re looking for something different, or if your laundry room doesn’t lend itself too easily to remodeling, consider a few aesthetic changes. Create an accent wall by painting it a contrasting, yet complementary, color and hang a full-size bulletin board patterned and decorated to your taste. 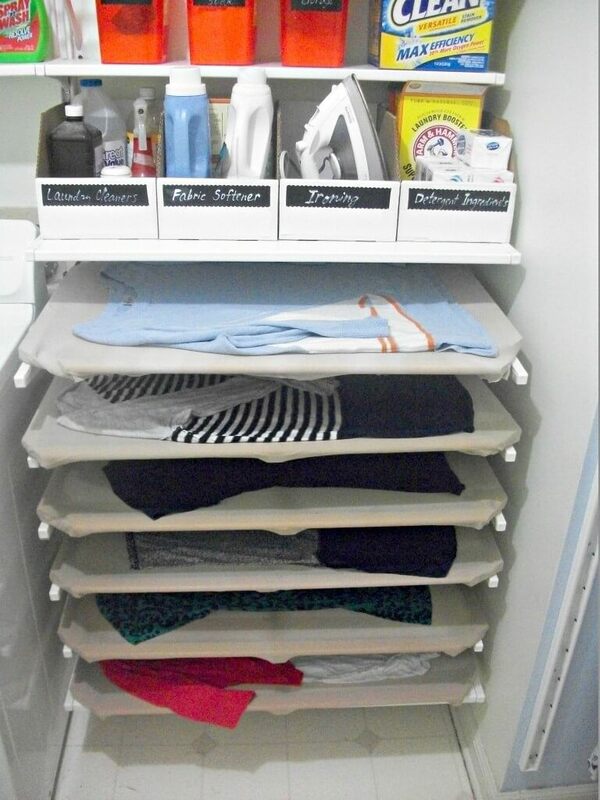 This is one of the most practical laundry room organization ideas! 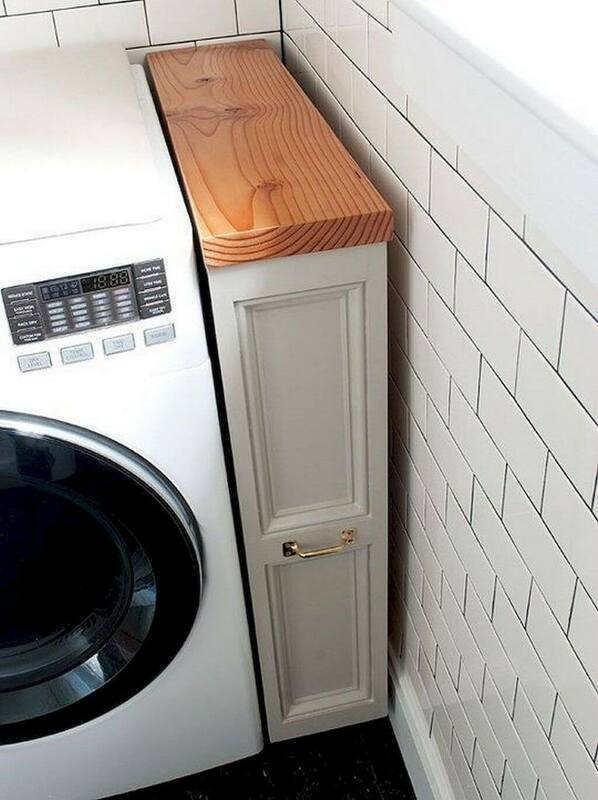 Convert the small gap between your washer/dryer into a hidden, vertical drawer with built-in shelves. 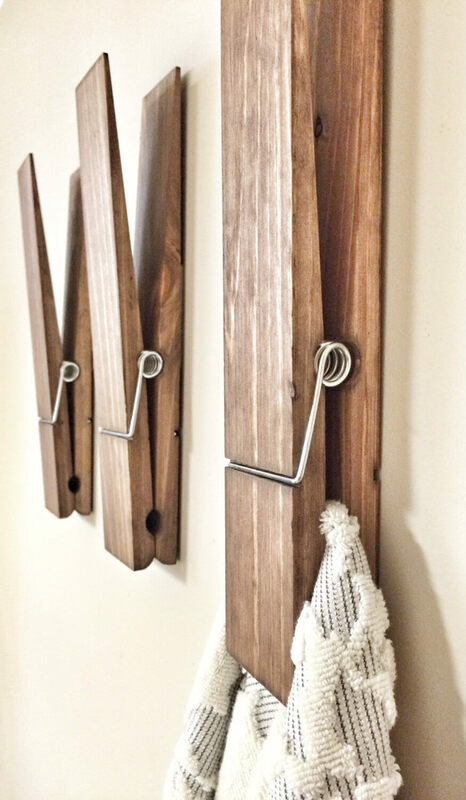 On wheels, this slides in and out from between the two fixtures and is ideal for holding detergents, your iron, and most any other accessory to your laundry room. All-in-all, this design concept is unique, yet practical. Who said that a backsplash was limited to a kitchen? Thanks to the rise of DIY home renovation and décor, we now have a myriad of wallpaper options to choose from. Your laundry room is the ideal place to have some fun with new, sleek designs. Accent one of your walls using wallpaper to create a textured look (e.g. brick) or invest in peel & stick backsplash pieces. Play around with contrasting elements and don’t be afraid to mix wood with brick and metal.